A unique hotel in Harads, Northern Sweden that allows guests to stay in tree house rooms, each with their own theme. 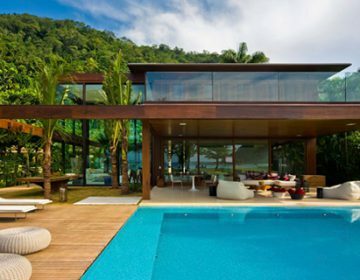 So far there are five unique tree rooms available and twenty-four planned to be built. The five tree rooms that are currently available for booking are the Cabin, the Mirrorcube, the Bird’s Nest, the Blue Cone and the UFO. The UFO room, wich is built to house four people, is particularly unique. From the outside the unit looks out of place in the forest environment. But then again where would a UFO blend in with its surroundings? Nevertheless, the UFO looks realistic, like a spaceship you would only see in the movies or your imagination. Beyond the futuristic exterior is a modern and comfortable interior with celestial accents. 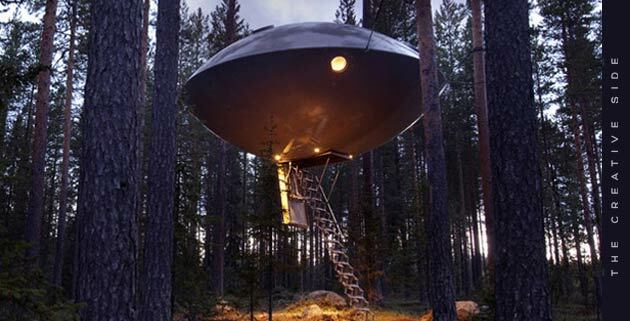 This UFO room is no doubt the perfect place to take the family for a futuristic camping trip. What better way to escape reality and relive your childhood?